Flamborough is one of the great primary lights of England and certainly one of the most impressive lights still active on the north east coast. The tower dates from 1806 when it was built by John Matson of Bridlington to the design of Samuel Wyatt. Matson spent £8,000 pounds on the project and the light was first lit on 1 December 1806. Since its inception the lighting equipment has undergone many changes: originally oil-burning, the lamp was electrified in 1940 and additional modifications were made in 1974. An electrically powered foghorn was installed in 1975 replacing the earlier diaphone equipment (even earlier than the diaphone foghorn, rockets were launched in foggy weather at the rate of one every 5 minutes and these are reputed to have reached a height of 600 feet). 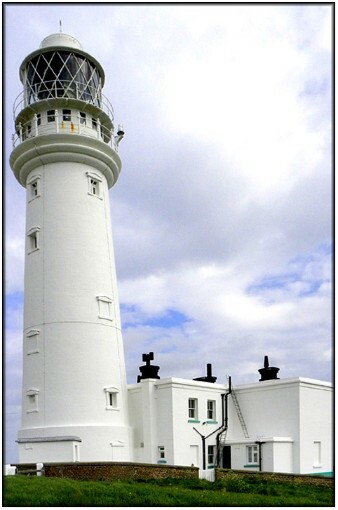 In 1996 the light was fully automated with the last keepers leaving on 8 May. In common with most Trinity House lights, it is now controlled and monitored from Harwich. This lighthouse is a major tourist attraction and ample parking is available as well as all the other touristy things such as a gift shop, ice cream sellers, hot dog stands and so on. The lighthouse itself is also open to the public from March to October each year (except for Mondays and Tuesday), and guided tours are available. Photographically the site presents few problems and it is possible to walk most of the way around the site ensuring that a well lit shot should be possible at most times of the day. However, some viewpoints (particularly from the public car park) suffer from some foreground clutter.